As you can see they occur in both arrays at the same time suggesting that the calculation method is the reason. The day was completely clear and the array sees minimal shading in early morning and mid afternoon, neither of which correlate with the blips. Checked my settings and found that the temperature being recorded was an amalgamation of the weather station temp and the inverter temperature. The blips correspond with the temps recorded which seems to alternate between the invert temperature and the weather station temperature. I don’t know why it does that but I disabled the Temp on the inverter page and the blips are going away. It would appear that the temperature recorded is utilized in the calculation of Insolation. It is my guess that the temperature gaps occur because the Isolation calculation are affecting the temperature which is being recorded. I disabled the inverter temperature about 11:30. 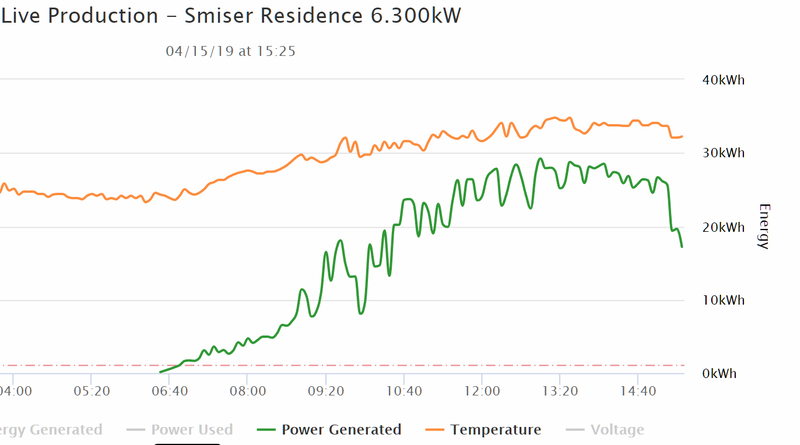 So the higher inverter temperature was depressing the Insolation value. That also explains why my Isolation values were low before I started recording my weather station data. Ah - this will explain why my insolation curves have developed a ripple since I added the temperature tracking via OpenWeatherMap recently. Before, I wasn’t tracking temperature at all, and my insolation curves were perfectly smooth. Ideally the temperature should be measured at the panel but this requires more equipment. My weather station (ambient weather WS2000) is about 40 feet away and somewhat higher than my panels. However, most of the day when the sun is shining the prevailing wind is from the West by West Northwest direction from the ocean. The ocean air temperature on the Southern California coast is fairly constant constant during the productive hours so my panels see the sea breeze most afternoons and the temperatures are fairly constant. For the longest time I couldn’t figure out why my Insolation was so low and then I found through this analysis that the temperatuer used in the calculation is that which is displayed on the Generation page. 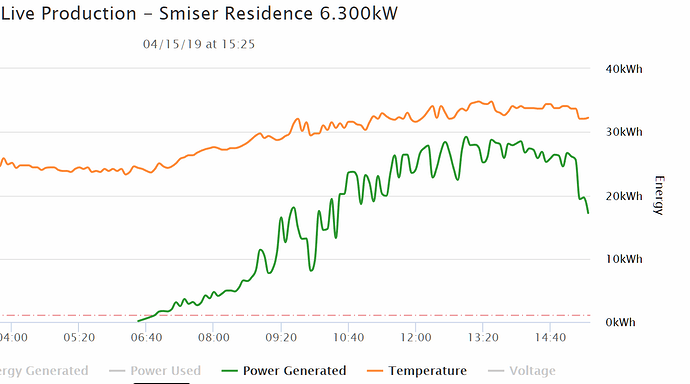 I was using the setting which enabled the recording of the Inverter temperature and sure enough the higher it went the lower the Insolation. Disabling it solved the problem. I just checked and now the Isolation has been oscillating since 2 PM today. Before that it was smooth. I am really not sure why because the temperatuer curve is not oscillating. Checked again and all the squiggles shown in the previous post are gone.